If anyone comes to me without hating his father and mother, wife and children, brothers and sisters, and even his own life, he cannot be my disciple. Whoever does not carry his own cross and come after me cannot be my disciple. I would like to turn our attention though to a hatred that we should all embrace. We value and allow our opinions, beliefs and our worldview to rule our life instead of the Gospel and the teaching of the Church – in every area of our life. I believe there is a new type of Catholic duality that has emerged in our midst. The new Catholic is the one who is the evangelist and faithfully obeys the doctrines, dogmas and precepts of the Church all the while not allowing for the transforming work of the Holy Spirit. Living a double life. Don’t get me wrong. We all find ourselves in this position at times. But I am talking about the obstinate person who wants to live the Gospel on their own terms. Maybe if we are worried more about how our culture is influencing us and less about everyone loving us, what we are doing on our time off and what music mesmerizes our soul; perhaps we would be happier and healthier. It is true that we need to understand the culture we live in but that does not mean we need to participate in it wholesale. Do we proclaim the Kingdom of God while in the secret of our homes allow ourselves to be evangelized by the entertainment of this culture? In our business dealings, do we capitalize on the weaknesses of others to get ahead? Our music, the chief evangelist of any culture, how does it square with the Gospel and a true Catholic anthropology? Do we welcome those who “call us” on to holiness or flee to those who will “tickle our ears” (2 Tim. 4:3), compliment us and make us feel good about ourselves? We need to submit our attitudes, opinions and even our activities to the Lord. For the past 100 years, we have lived by the maxim that we are “people in progress” – usually to suit our own needs. With the help of the Lord’s grace we are not the same person yesterday as we are today. That is what it means to be a person in progress. It does not mean that we can view our bad habits and vices as something we will give up one day thereby giving ourselves tacit approval to retain them today. The Lord said, “Repent and sin no more” (Jn. 8:11). How do we begin? 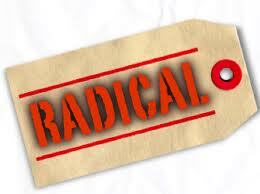 We become radical – not the 1960/1970’s radical but a true radical. Merriam Webster defines radical as getting back to the root. So it is not acting like some crazy person – though that is usually how the culture views it. To heal this area of our life we first need to re-sensitize ourselves (being desensitized is not an excuse but the proof we enjoy the culture’s poison) by submitting ourselves to Scripture and the Church’s teaching during an extended “retreat” from our entertainment. Once we can see, hear, smell, taste and touch what is not of the Lord then we can start living the joy-filled life the Lord promised us. In fact, we see that our ministry increases because we are no longer living a double life but we become the Gospel we proclaim. No worries, this is possible! Find some friends or family that will join you on this journey. Let them encourage you and you encourage them. Embrace the truth, regardless of the pain. Then pray, hope and don’t worry. Our Lord will be there to assist us in our need and comfort us in those times when we skirt the edge of despair. As September begins, let us cast off the the old man and take upon Christ our light and life. I urge you therefore, brothers, by the mercies of God, to offer your bodies as a living sacrifice, holy and pleasing to God, your spiritual worship. Do not conform yourselves to this age but be transformed by the renewal of your mind, that you may discern what is the will of God, what is good and pleasing and perfect.